A great way to jump-start an indoor garden of fresh, healthy microgreens! 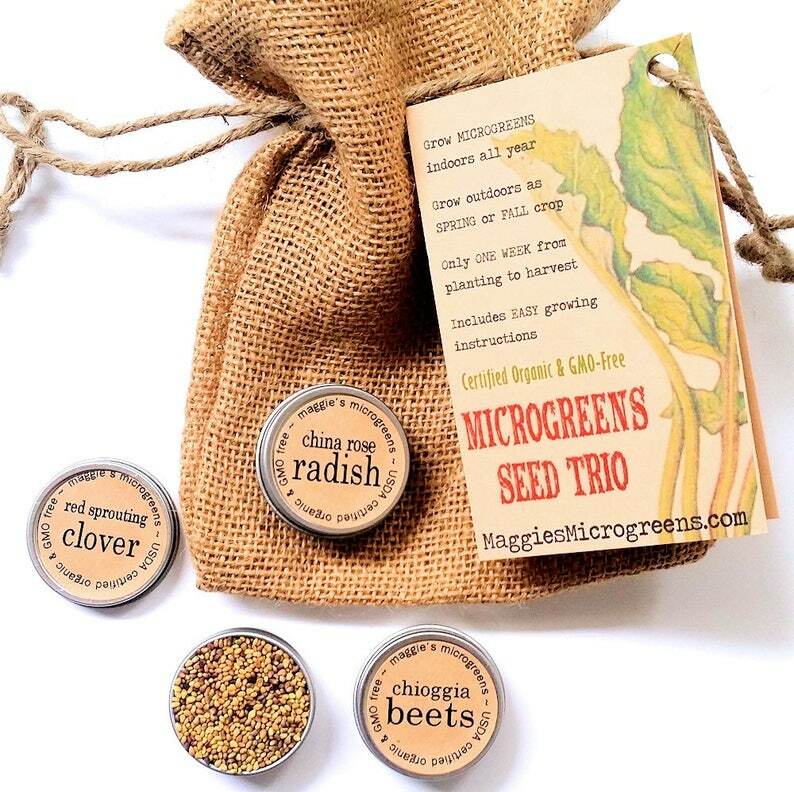 This is a *mini* set of 3 types of of my certified organic microgreens seeds - you choose any 3 for a custom kit! - in 3 small airtight tins in a natural burlap gift bag, along with super-easy, detailed growing instructions. It's a great gourmet gift for beginning or experienced gardeners, or a fun project set for kids. I include one half-ounce / 8mL of the seeds you choose in each round tin, enough to successfully raise 2 to 3 generous crops of each type in a teacup or pocket garden - whether one of my DIY planter kits, or teacup-sized planters of your own. This amounts to 4 to 6 months of fresh greens! Climate permitting, you may also grow these microgreens outdoors. All my seeds are USDA-certified organic, GMO-free seeds produced specifically for microgreen growing - meaning, they are not treated with fungicides or fertilizers as conventional garden seeds often are. > I ship to any US or Canadian address via USPS First Class mail. > If you need your seeds in a hurry, I offer a Priority shipping upgrade at checkout. > Sorry, I can't ship seeds outside the US and Canada, due to international import restrictions on agricultural products. 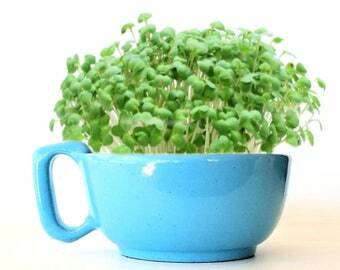 Anyone can grow microgreens, anywhere there's a little sunshine, any time of year. Requiring only a week or two from the time you plant to the time you harvest, microgreens provide instant gratification for busy people, and can be a fascinating project for children. Each seedling you cut will taste amazingly like its grown-up counterpart: radish microgreens are spicy like a radish, amaranth microgreens taste like an earthy grain, and broccoli microgreens taste like, well, broccoli! Microgreens can be used in any recipe that calls for sprouts: they're super in salads, stir-fries and sandwiches, for starters. Toss a handful into smoothies ... fold some into an omelette! I bought this for my dad's birthday, and I won't even need to wrap it because it's already packaged as a gift. I know my dad (who's a hobby gardener) is going to love it. The cutest packaging, love it can’t wait to give it as a Christmas gift!